As membership for all parties has fallen money via members has dried up, there is a limit to how many dinners, speeches and auctions the ordinary member can contribute towards so big donations are ever more welcome. 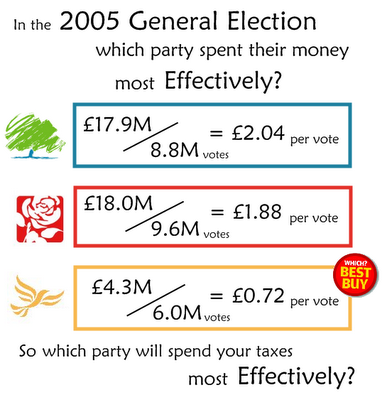 The Lib Dems do reasonably well, but we don’t have lots of large donors, evident as we have a quarter of the other parties funding in 2005 election. Labour are very reliant on trade union funding, but this was not quite the case during the Blair years. The Tories are still backed by their Michael Ashcroft’s and hedge fund managers. Luckily we don’t have the same lobby group impacts as in America where individual politicians themselves can be funded by big tobacco companies or farming unions. For background, my event on Monday is open to all members of the public and is bringing trade into an otherwise quiet night for the pub (Green Room 45a Goldhawk Road, Shepherds Bush). I’m also grateful for the support of sponsors Patio Polish restaurant, The Ritz Greek restaurant (not the hotel chain!) and Top of the Town Chinese restaurant, who have covered costs and allowed the money raised to go straight to the campaign.